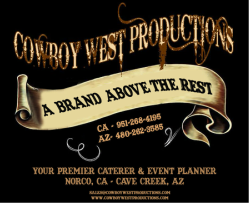 At Cowboy West Productions we implement the Code of the West, which is that we will always take pride in the work we do for you, and we always finish what we start for you! Check out our Code of the West Ethics Page, which is our rule book. but culinary artisans in all menus.